Skin problems are a very common health complaint. For most, a little healing cream can often cure minor rashes. But for those with ongoing struggles with eczema, finding a treatment that works can be more of a challenge. If you suffer from this skin condition, you’ll want to hear about the results of a recent trial conducted in the US: both acupuncture and adopting a gluten-free diet may be the alternative cures you’ve been looking for. The study involved the case of a 48-year-old woman who had a number of health issues. These were described as “intense” skin rashes, eczema, heartburn, chronic constipation, headaches, and an intense feeling of heat for four months. PLUS: Unsure of what to eat if you want to try a gluten-free diet? According to the researchers, the patient’s symptoms began in March 2008. 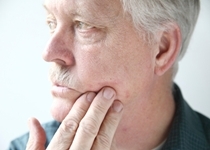 She began using topical and oral steroids and felt that her symptoms were not responding. At this point, acupuncture treatments were started. The woman was given three treatments a week for 12 weeks. At the end of the first 12 treatments, the skin rashes and constipation were resolved completely—and she had temporary relief from the heartburn. At the end of another set of 12 treatments—during which a gluten-free diet was also adopted—the heartburn, headache, and eczema were resolved. At the end of a third set of 12 treatments, all of the patient’s symptoms disappeared. Steroid treatment was stopped after the first 12 treatments. This is an example of how acupuncture, along with a gluten-free diet, can help to heal not only eczema but a number of unrelated health complaints. Acupuncture and adopting a gluten-free diet could provide relief from eczema.